Keilanei Cooper (10) and her Murrieta Vista teammates will be at home again Wednesday at 6 p.m. in the girls basketball playoffs. Two basketball teams and one soccer team will represent Vista Murrieta High School the next two days in the CIF Southern Section playoffs. The Broncos boys basketball team (17-11) will be at home Tuesday at 7 p.m. against Burroughs High of Burbank in the Divison 1A quarterfinals. Vista advanced with victories over Riverside Poly and Cypress in the first two rounds. Also on Tuesday, the Broncos girls soccer team will play at ML King in the second round of the Division 2 playoffs. The Broncos won their first-round game over University, 6-2, on Feb. 18. 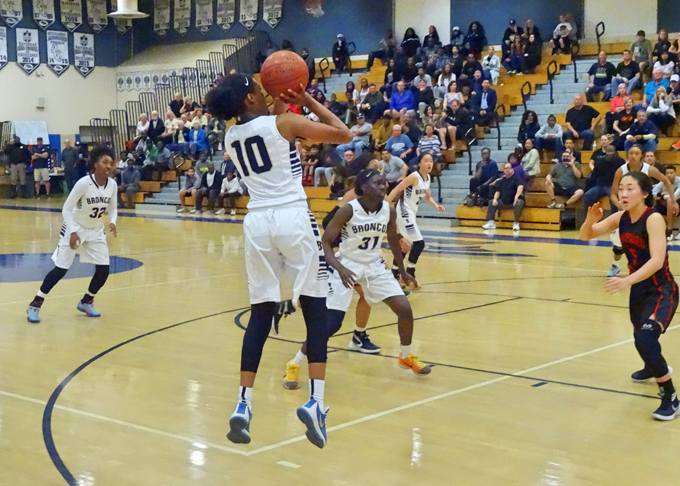 In the elite Open Division of the girls basketball playoffs, Vista Murrieta (26-2) will play host to Windward in a 6 p.m. quarterfinal game. The Broncos defeated Harvard-Westlake 68-65 in the first round on Saturday.